A group of colleagues, each with a form of ESP, are invited to a hotel owned by an old acquaintance who recently committed suicide. They believe he may have uncovered the secret of Toulon the puppet master and hope to find where he hid it. However, they are met by a group of murderous puppets who seem determined to eliminate them one by one. Oh, look, another killer doll movie! As you may have seen from our last few reviews, the late 80's contained a treasure trove of movies featuring murderous toys. It started with "Dolls," then "Child's Play, which popularized the subgenre, and eventually in 1989, we had director David Shmoeller's "Puppet Master." The film stars Paul Le Mat, Irene Miracle, Matt Roe, and Kathryn O'Reilly, who play four colleagues named Alex, Dana, Frank, and Carissa. Each person has a different form of ESP. After they all have a separate vision, they believe an old colleague of theirs named Neil Gallagher, played by Jimmie F. Skaggs, has learned the hiding place to the secret of Andre Toulon the Puppet Master. So, they head to the Bodega Bay Inn that Neil and his wife Megan, played by Robin Frates, had recently acquired in order to search for the secret of Toulon. Once there, they learn of Neil's untimely death and find out they may be about to meet their doom at the hands of Toulon's puppets. 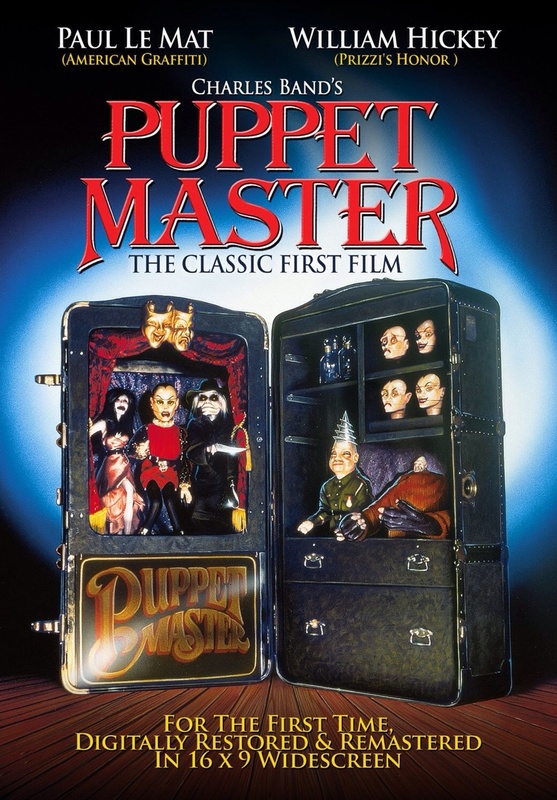 We really enjoyed "Dolls" and "Child's Play," so we decided to continue our killer doll mini-marathon with "Puppet Master." It was while watching this feature that we hit a brick wall of boredom and our awesome little killer doll adventure was derailed. What we were hoping for was a movie focused on Toulon's killer puppets, and though they eventually show up at the tail end of the film, far too much time is spent focused on the human characters. We neither care for or care about what happens to these four abrasive psychics with piss poor attitudes. We found ourselves waiting for the puppets to show up and do their business and then proceeded to root for them when they did. It really takes too damn long for this movie to get going, and in all the time before the puppets show up, "Puppet Master" is slow paced, devoid of tension, and just not engaging at all. Luckily, the puppets themselves look cool, and we get a little stop-motion animation and other FX work that brings them to life. Each puppet has its special trick and different attribute, so we get a bit of creativity there, but beyond that, there isn't much else with this flick. It's poorly acted, badly written, and not well directed, and it is one of the more forgettable killer doll movies. It's a bit of a mystery to us how it spawned so many sequels.